Meredith and Nick celebrated their 1 year wedding anniversary this summer in Newport, Rhode Island and brought me along to take photos of their adventures around town. It was so much fun! We met for a glass of rosé at Castle Hill, then headed over to Brenton Point State Park where we scaled rocks and chased the waves. 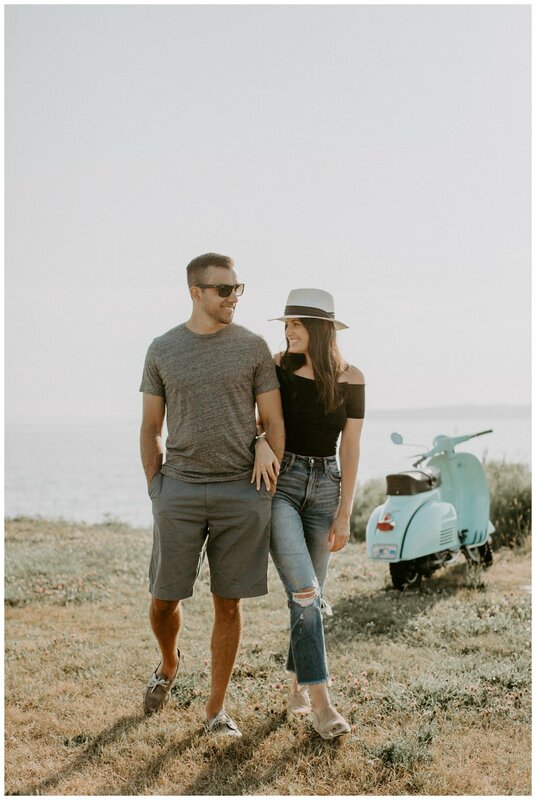 As if that wasn’t magical enough - we stumbled upon the cutest little vespa that belonged to a rad surfer chick who was nice enough to let us take photos with it!! SO CUTE!! We ended the night with a pretty pink sunset at Gooseberry Beach. The light was golden, the breeze was warm, and the air was salty. It was perfect. Im so happy I was able to do this session with these two cuties. Celebrating their anniversary with them filled my heart with so much joy. Thank you for trusting me to capture your love, Meredith and Nick!